The Escondido Fire Department Cares About Your Business! 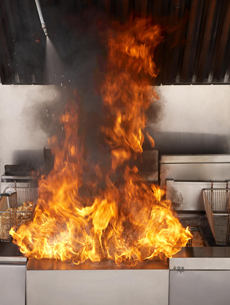 The Escondido Fire Department uses a variety of fire and life safety codes to assure that conditions are as safe as possible for business owners, employees, and the public—as well as for our firefighters in the event that a fire or other emergency occurs at your business site. Any time you make physical changes to any part of your business, those changes must comply with all local codes. We recommend that you consult with a professional who knows these codes prior to making any plans in order to prevent costly or dangerous mistakes. Building and tenant improvement plans need to be submitted to the City of Escondido Building Department. The Building Department will route the plans to the Fire Department for review and approval. County plans must be submitted to the County of San Diego Building Department (Rincon del Diablo area) for approval. If your plans are not approved, remarks will be made indicating how they must be altered before work can begin. Even changes in the layout of your facility, including installation of storage racks or new equipment, can impact the safety features engineered into your building and will need to meet Fire Department requirements. Checking with the Fire Department or other knowledgeable professionals can prevent your business from being shut down because of fire code violations. The Escondido Fire Department looks forward to hearing from you regarding any questions you may have. Please contact us at 760-839-5400 for further information.